Our site has always been a nursery of some sort, and in 1991, Thomas Hobbs and Brent Beattie acquired the existing, but floundering, retail garden centre known as Southlands Nursery. 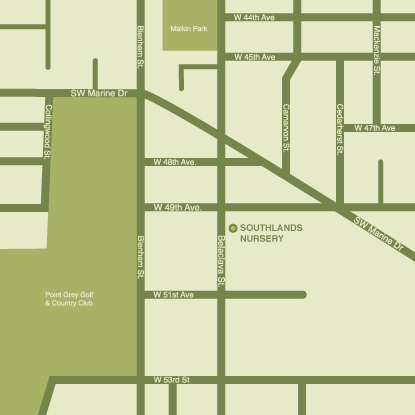 Being experienced retailers, with two successful businesses in the nearby 'Kerrisdale' shopping area, Tom and Brent reinvented the nursery as a tasteful destination for exciting plants at fair prices. Typical, boring spaces have been transformed into visions of creativity and inspiration. A small loyal staff of 'plant geniuses' add knowledge and depth of inventory to the mix. * For more detailed directions just click on the map.